Irene Latham began the Kidlitosphere Progressive Poem in 2012 as a way to celebrate National Poetry Month. Each year begins a new poem with a new line added each day of April as 30 poets pass the poem from blog to blog. Watching the poem progress is something I look forward to every year. One thing that Irene shared in preparation is that “our aim this year is a poem for children”. I’m so glad she stressed that. I think it gave just the right amount of direction and focus for the poets. And so far, this poem is my favorite of all Kidlitosphere Progressive Poems. Here is the poem so far. Linda Baie wrote Line 9 which offered all sorts of possibilities as she passed the poem to me. Today I’m adding Line 10 and will share a little bit of my thought process as I came up with the line. In our poem, I picture a child that is creative, and through creativity has had fantastical experiences. Keeping that in mind, I kept coming back to one of my favorite words in the poem given to us on Day 4 by Michelle Heidenrich Barnes. That word is dragonwords. (Imagine me liking a word with dragon in it 🙂 ) When I read dragonwords, my mind went a lot of places. I wanted to keep her word alive in some form because to me it speaks of the child’s experiences which influence her/him going forward. Also, Linda suggested that one thing missing in her eyes might be a friend. I love that. But I wondered if a friend (who may or may not appear in the poem) would be human or be another sort of friend for this special child. Would the child need to speak “dragon” to a dragon or to another being with shared “dragon” experiences? Whatever my come, I had to give a nod to dragonwords whether it plays a part in the child’s ongoing adventure or not. Here’s the poem so far with my line added. 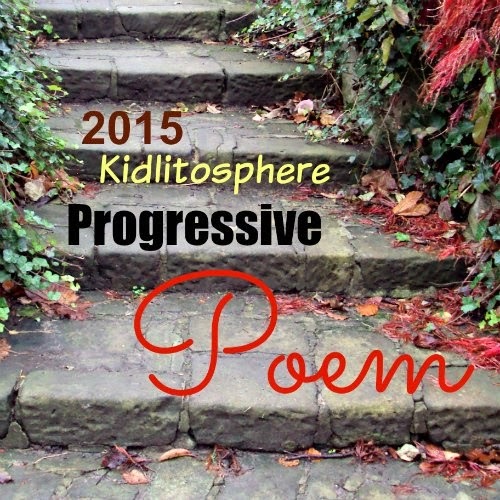 Below is a list of participating poets with links to their blogs so that you can follow the 2017 Kidlitosphere Progressive Poem. You can find the same list in my right sidebar for easy reference. Happy 10th Blogiversary to Irene Latham—A Wild Celebration! Today I’m helping poet, Irene Latham, celebrate her blogiversary. It’s the BIG 10. Irene’s “one little word” for this year is “wild” so how fitting that she has a Wild Roundup over at her blog. I met Irene online and am wild about her poetry! In saying congrats to Irene, I want to reshare a poem I wrote which was inspired by rabbit tracks in the wild.